Oh Hi! Hello! It’s been months since I have shared a post over here. Last year was very quiet for this little online space of mine. Mainly because life was just so busy. The renovations took over most of the first half of the year. And then with Bella starting school in September and me working more it’s just been very full on over here. Life is still just as busy. But I’d really love to start sharing more again. More style posts, more interiors, more recipes I love and just more general personal ramblings. 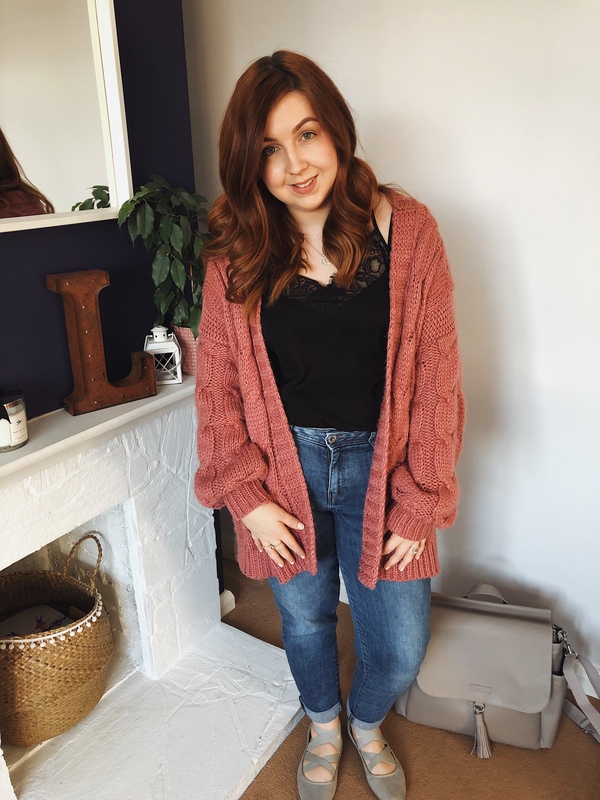 So I’m kicking off the new year with a style post! 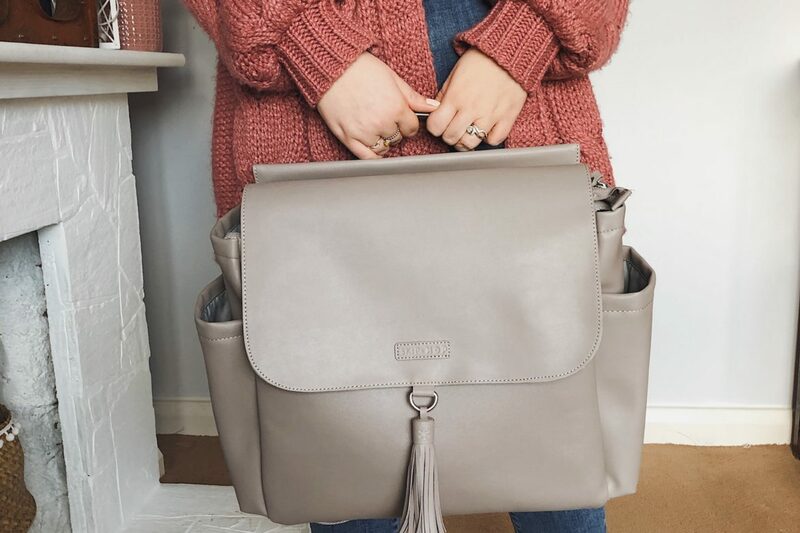 It’s an outfit I wore at the weekend which I loved and I wanted to share with you all about my new favourite bag. It’s been super chilly in East Sussex over the last week or so, we’ve had a few days of snow and a hell of a lot of ice. I have been cooped up at home with two sicky babes which hasn’t been much fun. The horrible germs that come with winter is definitely my least favourite thing about this season. I’m already dreaming of warmer spring days with less layers and being able to leave the house without a coat on. Thanks to the sick bug that graced our house last week, I spent most of the time in my comfies with my hair chucked up in a mum bun on top of my head to try and avoid it coming into any contact with puke. No one wants sick in their hair now, do they? So by the time the weekend rolled around I was desperate to get dressed into something nicer, to do my hair and make up properly and just get out of the house! I opted for my favourite ‘mom’ jeans paired with a black lace cami tucked in and my huge chunky pink cardigan thrown over the top to keep me nice and cosy. I definitely should have thought more about my shoe choice before leaving the house though as those ballet pumps left me with frozen cold feet! Eeek. As I was going out with the children in tow I took my new Skiphop Greenwich Convertible Backpack which is in the shade Portobello. I’ve had a few different change bags since becoming a Mama but this in hands down he best one I have ever owned. I think the thing I love the most is how stylish it is and how it really doesn’t look like a change bag. The bag is made from vegan leather which means its easy to wipe clean which I think is a huge bonus. It’s incredibly roomy and has plenty of space for nappies, wipes, spare clothes and even drinks and snacks. Which makes it so much easier than having to take a a separate lunch bag out for those things too. It has a long shoulder strap which is super comfy. I also don’t find it slips down like others I have had before. But what makes this bag unique is you can covert the straps into two shoulder straps so that the bag can be worn as a backpack too. Which is perfect if like me, you have an older baby that’s walking as it means you can wear it on your back and still have your hands free to chase your crazy toddler around! I totally wish I had this bag when Hugo was a newborn as it would have been perfect. There’s two pockets for bottles, nine different compartments and there is a padded change mat included. It also has super handy clips so you can attach it to the pushchair too. Overall it’s a super versatile change bag which I think grows with your baby. I have really enjoyed using it over the last few weeks and received so many compliments on it! The Skiphop Greenwich Convertible is available to purchase from Amazon here. Hello! Beautiful bag! But, Is this bag grey? it seems like beige or grey but I am not sure. Thank you!